Today the majority of Eastern Orthodox Christians celebrate Lazarus Saturday. For Western Christians today is Holy Saturday, the day after Good Friday and the day before the great feast of the Resurrection of Our Lord and Savior. I've written about Lazarus Saturday before. My last post that was just about Lazarus Saturday I shared the hymn Rejoice O Bethany because I had been mediating how how Lazarus's resurrection is a foreshadowing of Our Lord's rising from the dead but also meditating on how we are made alive in Christ. Today though I experience Lazarus Saturday through the perspective of Supergirl. From the backseat: "When will we put Jesus on the cross? Is that this weekend?" Me: "No dear. This weekend is Lazarus Saturday and Palm Sunday. But this week will be Holy Week. 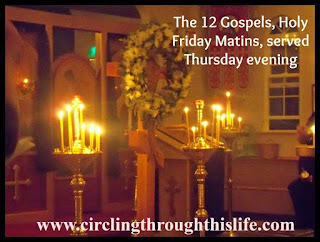 The 12 Gospels service will be on Thursday"
** Note the service that is served on Holy Thursday evening in the 12 Gospels Matins. We have 12 gospel readings that that us through the Passion of Christ and at the appropriate point cross is brought out an an icon of Christ is hung upon the cross. Then this morning at church: "Mama! Where is the purple? I don't see the purple." The cloths that line the altar and the stands are purple during Lent. For Lazarus Saturday they are gold. The priests and altar servers were purple during Great Lent and they switch back to gold for Lazarus Saturday. I explain: "Oh well Lazarus Saturday falls out outside of Lent. Lent ended yesterday so today we have gold. Do you know what color tomorrow will be?" Mantha: "Green! Palm Sunday is green!" She grins from ear to ear because green is her favorite color. 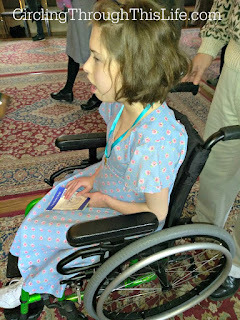 "Mama, will we see sing this on Pascha? When do we put Jesus on the Cross again?" She is really hung up on putting Jesus on the cross but I think I understand why. You see if he doesn't go up on the cross, he can't come down. He can't go into the tomb and he can't rise again. She very patiently explains that he will live again. He is living now and he will live again. She also commented on the fact that we did not sing Rejoice O Bethany. I told her that we didn't have enough choir members and we would listen to it on You Tube when we got home. She then remarked, "but we'll sing it tomorrow." Yes peanut we will. We are made alive! We are made alive! in Thee, O Jesus are made alive! For my readers who celebrate the resurrection of Our Lord and Savior tomorrow Blessed Feast Day! For my readers who celebrate Palm Sunday tomorrow Blessed Feast Day! What a sweet exchange between the two of you. Happy Easter!